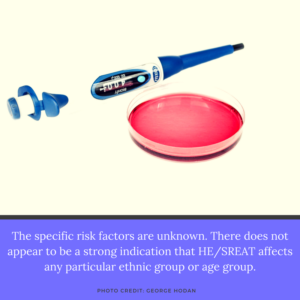 The specific risk factors are unknown. There have been a handful of studies describing the presentation of HE/SREAT in patients with Down Syndrome.3 This is not to suggest that individuals with Down Syndrome have a higher likelihood of developing HE/SREAT, however, a sudden or acute onset of psychiatric symptoms such as hallucinations or psychosis in the presence of elevated anti-thyroid titers may warrant increased suspicion in those with Down Syndrome. 2009 May, Vol.66, No.5, pg 663-666.